The TM-2440 is a compact, lightweight ambulatory blood pressure monitor with an algorithm that can detect and record irregular heart rhythms (IHB mode). Effectiveness has been demonstrated through verification of screening for arrhythmia1. The software that comes with the TM-2440 can analyze waveforms produced during measurement and easily determine blood pressure values. The OLED display indicates ABPM behavior during use. Easily check ABPM measurement values and the current mode in addition to the state of the battery and memory. 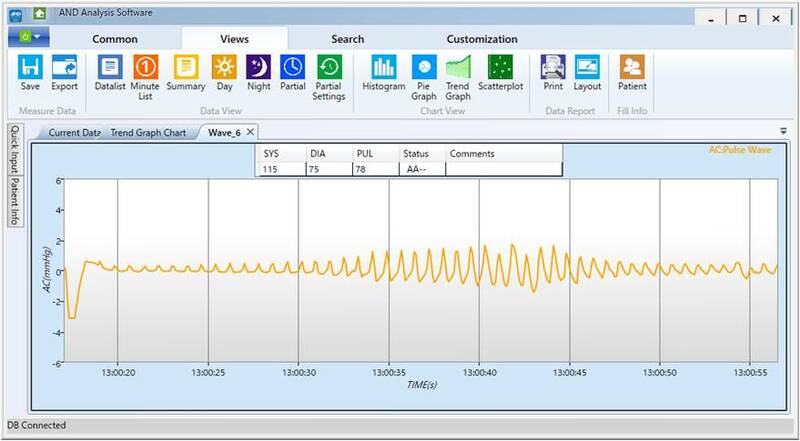 Easily download ABPM data from the monitor to a PC and analyze with the newly designed software. Data recorded by the TM2440 series is shown as a data list. Data appears as in the table above after download. 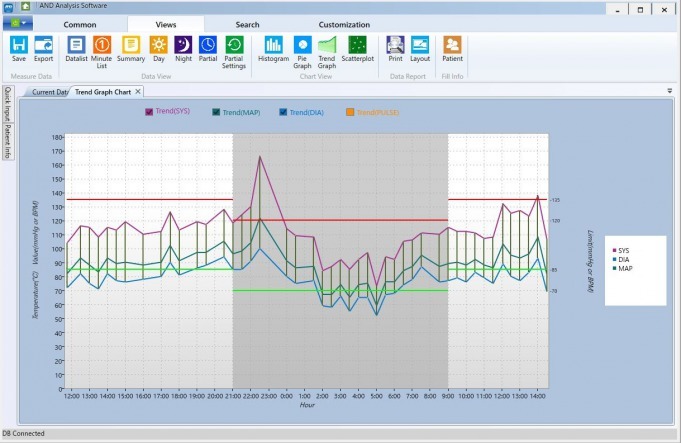 Data lists can be used to generate a trend graph chart similar to the one shown above. Night time is indicated in gray, giving a simple visualization of a patient’s 24-hour BP biorhythm. The TM2440 series records blood pressure as an oscillometric waveform. 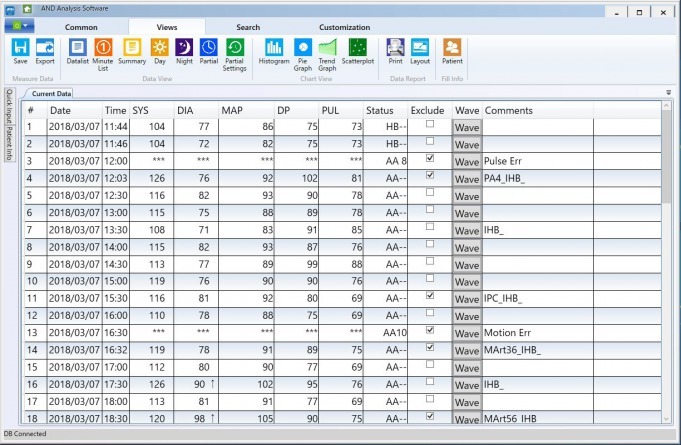 With the analysis software you can easily check the waveform record for each measurement. Quickly determine the accuracy of measured values. *The IHB detection function uses an algorithm for detecting pulse fluctuations. In some cases, the IHB mark may display due to body movement not caused by arrhythmia. Tomoyuki Kabutoya et al., Diagnostic accuracy of a new algorithm to detect atrial fibrillation in a home blood pressure monitor. J Clin Hypertens (Greenwich). 2017 Nov;19(11):1143-1147. Interval Setting OFF, 5, 10, 15, 20, 30, 60, 120 min.